Commencing in the Roman city of Porto, the home of Port wine, Portugal’s once wild river Douro has been tamed by locks into resembling a series of finger lakes, adding greatly to the valley's ambience. Leaving behind the Atlantic influenced greenery of the coast you are soon immersed in a Mediterranean land of olives, vines, and picturesque, medieval hilltop villages. 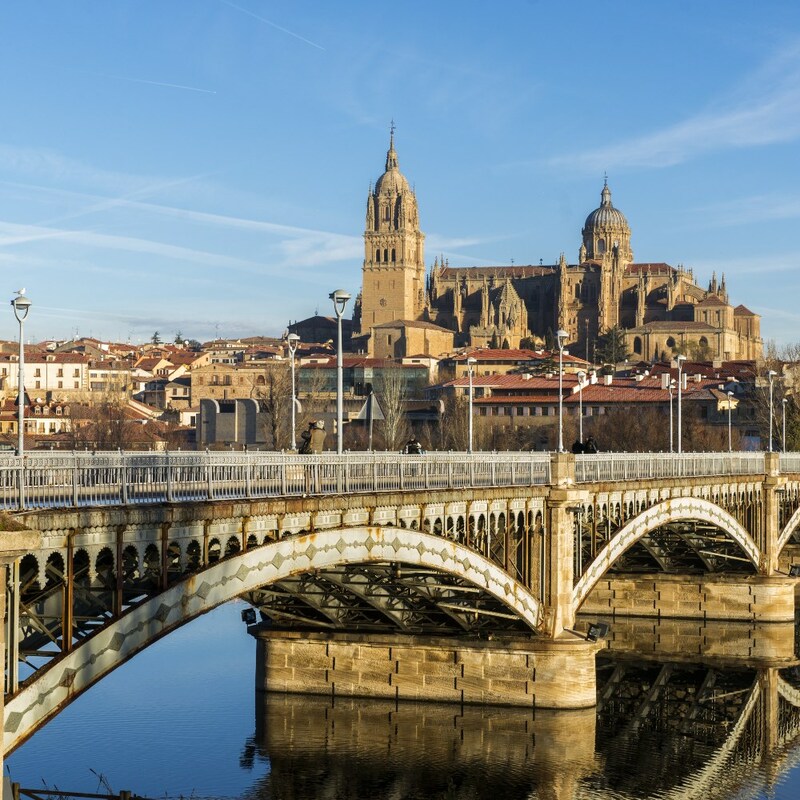 Our destination is the higher reaches of the valley from where we visit Salamanca - home of one of Europe’s oldest universities, two of its finest cathedrals, Spain’s finest city square and even the Inquisition! 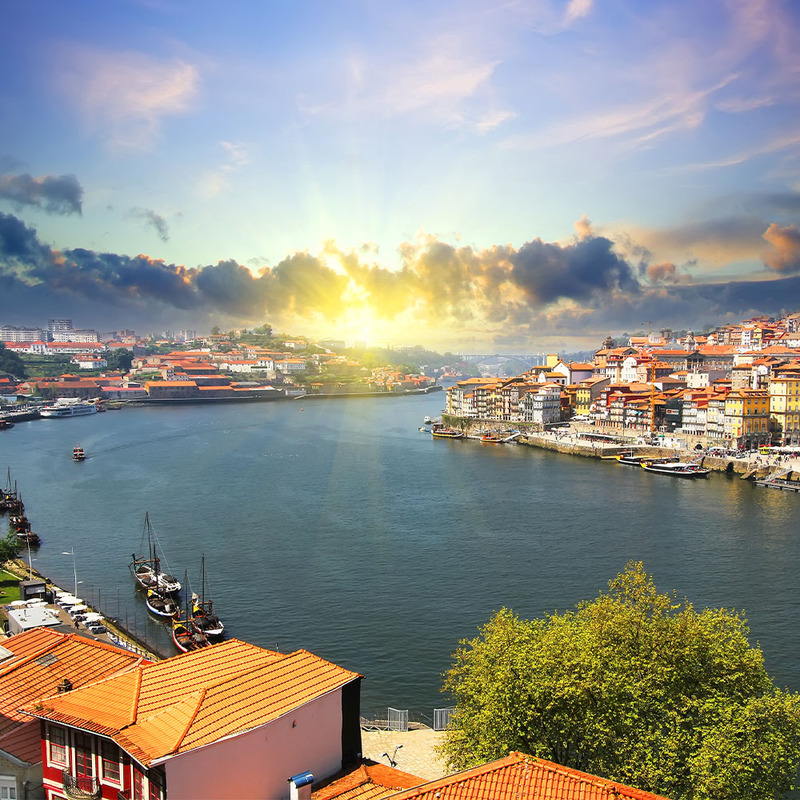 Strategically sited overlooking the Douro as it empties into the Atlantic, Portugal’s second largest city was originally a Roman town, but its wealth is derived from its knowledge of the sea routes to India, with fortunes made from trading spices, silks and other fine goods. This morning our guided tour of this interesting city unveils some of its major and more surprising sights. 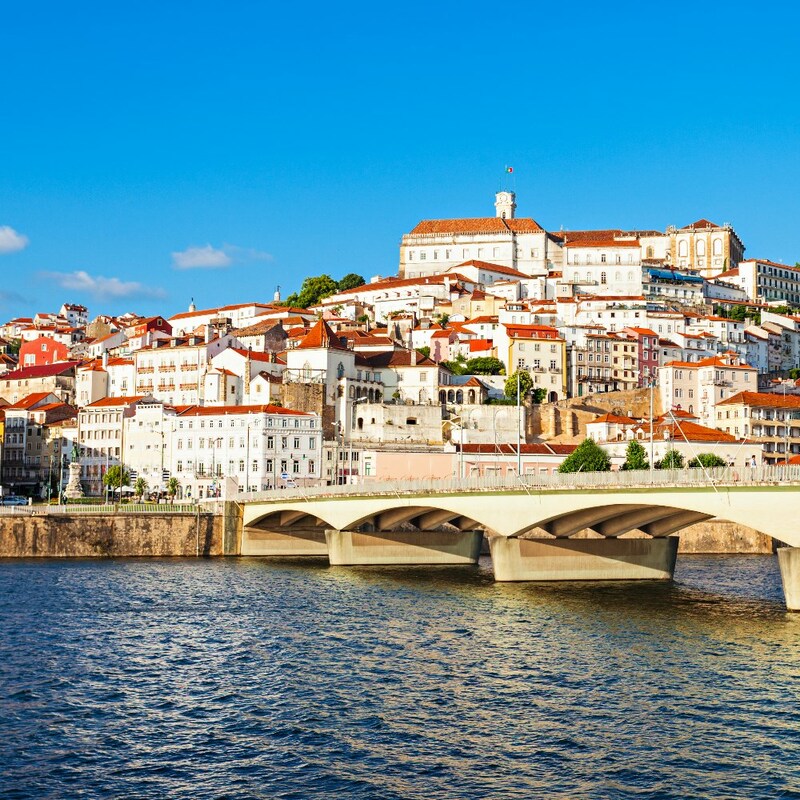 You’ll experience the tangled lanes of the medieval quarter, the splendid Praça da Ribeira square with its characteristic tiled townhouses and fine views to the wine lodges across the river. Gustav Eiffel designed one of the bridges, and you can immediately see the connection with his more famous Parisian creation! You’ll gaze up at the city’s imposing fortress, its fine cathedral and Baroque Clérigos Tower. Porto is wonderfully free of the chain shops prevalent elsewhere, and it’s a joy to see what the many traditional traders have to offer, from fine art, antiques and ceramics to some of the most wonderful cakes you’ll ever taste. We return to the ship and there’s an air of expectancy on board as during our first delicious lunch, we’ll slip our moorings and begin our stately passage upstream. 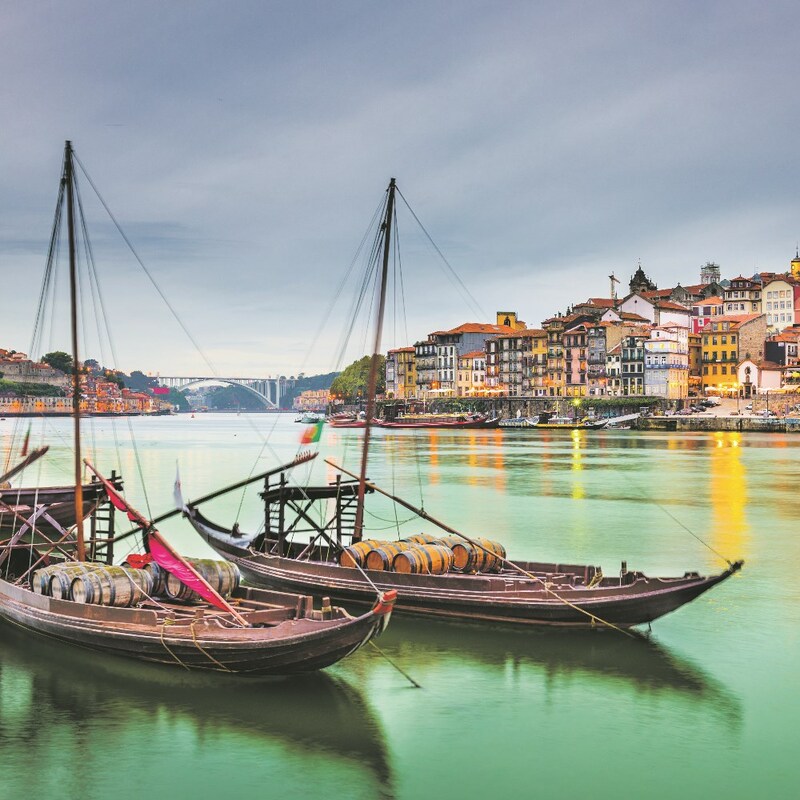 The Douro is one of Europe’s most captivating rivers and you can enjoy a leisurely afternoon up on deck or watching the glorious scenery drifting by from the comfort of your own cabin. Tonight, as you enter the restaurant for the Welcome Dinner, feel free to choose your table. All are expertly set with four or more seats and have excellent views through the large panoramic windows. Later, we will see a celebratory vintage port wine opened in the traditional way. We are moored overnight in Porto Antigo at the confluence of the River Bestança. As dawn breaks, early risers can witness the ship’s graceful departure. Relax over a leisurely breakfast whilst the ever-changing scenery idly slips by through the restaurant’s superb panoramic windows. One of the benefits of life aboard a river cruise is the sheer sense of relaxation it brings; our elegant ship slips its moorings during breakfast, after which there is plenty of time for a spot of pampering in the on-board spa, or simply watch the seamless changing of the riverbank scenery passing by from the comfort of a cosy seat in the lounge. We’re in port wine territory, where the lush hillsides have largely given way to a patterned landscape of terraced vineyards. Inland from the Atlantic, the climate has changed, too; it’s noticeably warmer and drier, while the area has a Mediterranean appearance with orangey, earthy colours replacing verdant greens. 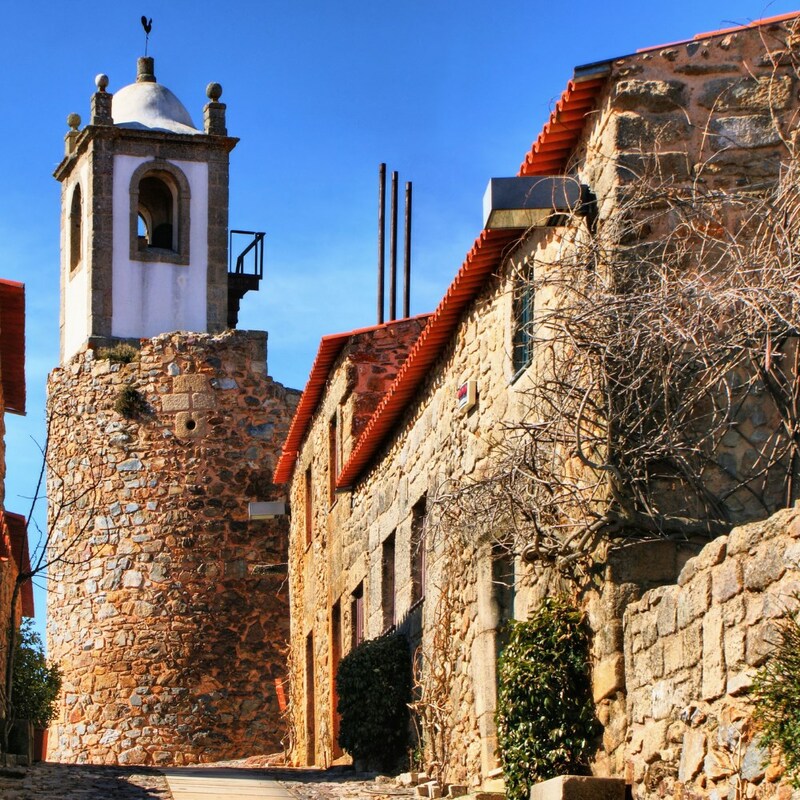 After another superb lunch on board, we cruise into the small town of Peso da Régua, from where we visit the grounds of the splendid Mateus Palace. Anyone familiar with Mateus Rosé and its characteristic ‘squashed’ bottle will recognise the palace from the label. Whatever your opinion of the wine, it is an impressive 18th-century Baroque edifice, mirrored in its stunning pond, surrounded by landscaped French gardens. 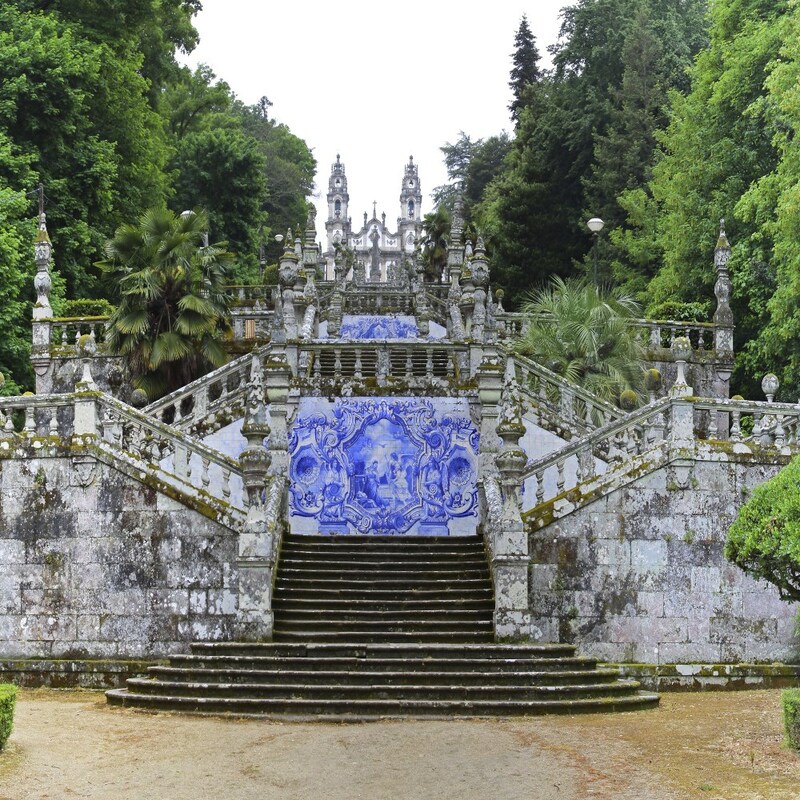 This morning after breakfast we take a short drive to historic Lamego, home of Portugal’s sparkling wine, Raposeira, and one of the first places to be reclaimed from the Moors in the 12th century. Situated atop the hill overlooking this lovely town is the ancient Sanctuary of Our Lady of Remedies church, its stairways adorned with attractive azulejos, the country’s characteristic painted ceramic tiles. 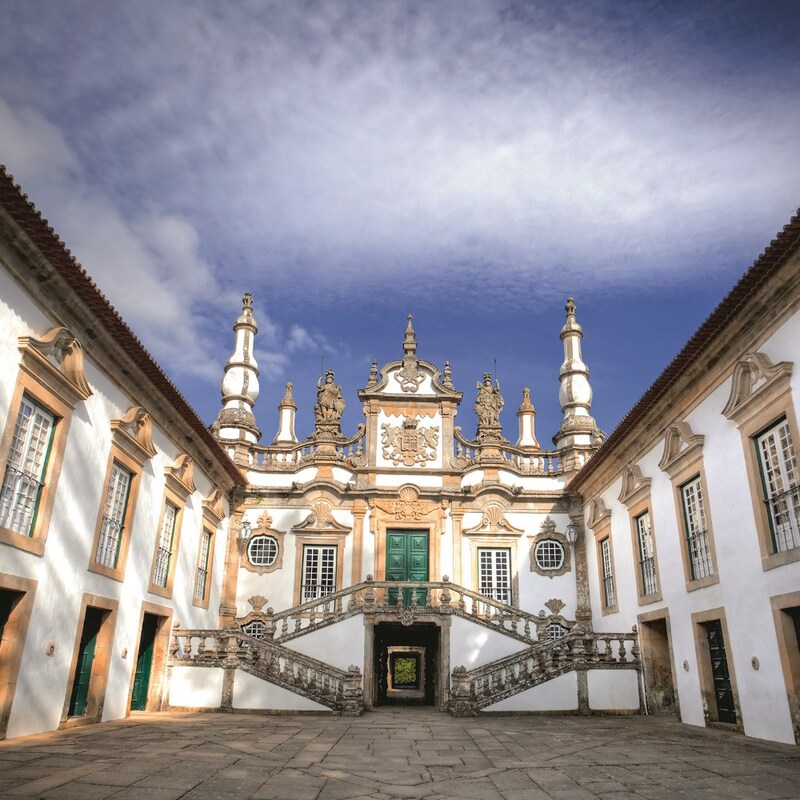 Later we enjoy a little indulgence as we visit one of the region’s best port quintas, or estate-vineyards, to learn how the legendary fortified wine is produced. This experience culminates in a much-anticipated tasting of the delicious final product. By the time we return to our ship, our chef and his team will be adding the finishing touches to another delicious lunch, ready to be served as we depart for Entre-os-Rios. After lunch there’s the perfect opportunity to take to the sun deck to enjoy the kaleidoscope of Douro views – or perhaps a spot of reading in the lounge over a cup of tea. There’s a perfect opportunity to avail yourself of some of the ship’s range of five-star facilities this morning – maybe a little gentle exercise in the fitness room before heading up to the sun deck to enjoy a coffee whilst chatting with newly-made friends as our ship makes a graceful arrival in Porto once more, passing under the city’s spectacular bridges. Porto is of course synonymous with wonderful port wine and all the famous port producers are here, such as Cálem, Sandeman and Ferreira, so a visit here would not be complete without a tour of one of them. You’ll learn about this fortified wine’s fascinating history and its close British connections. Port is made from grapes still pressed in the traditional way – by feet – then lovingly matured, sometimes for decades, before you can enjoy its subtle flavours. Of course, you’ll get the chance to sample various port styles at the end of our visit. After lunch you’ll have the rest of the afternoon at leisure to explore this truly fascinating city; so perhaps return to the terraced streets of the old town and wander the sloping maze of winding, cobbled alleyways, soaking up the atmosphere whilst stopping to admire the lovely architecture, soaring bell towers, fine baroque churches, golden rooftops and beautiful tiles of this slice of traditional Portugal. Stop for a drink in a cosy café and be tempted by an array of delicious cakes and pastries – perhaps sample a pastel de nata, the traditional Portuguese custard tart. Later we arrive in Lisbon, the capital of Portugal and the country’s finest natural harbour, situated at the mouth of the River Tagus. Nestled amid seven hills, the city’s skyline is a mosaic of pastel and ochre shades, peppered with elegant domes and soaring spires. We stay three nights at either the Hotel Marques du Pombal (2019 departures), Real Palacio Hotel or Olissippo Marquês de Sá (2020 departures). 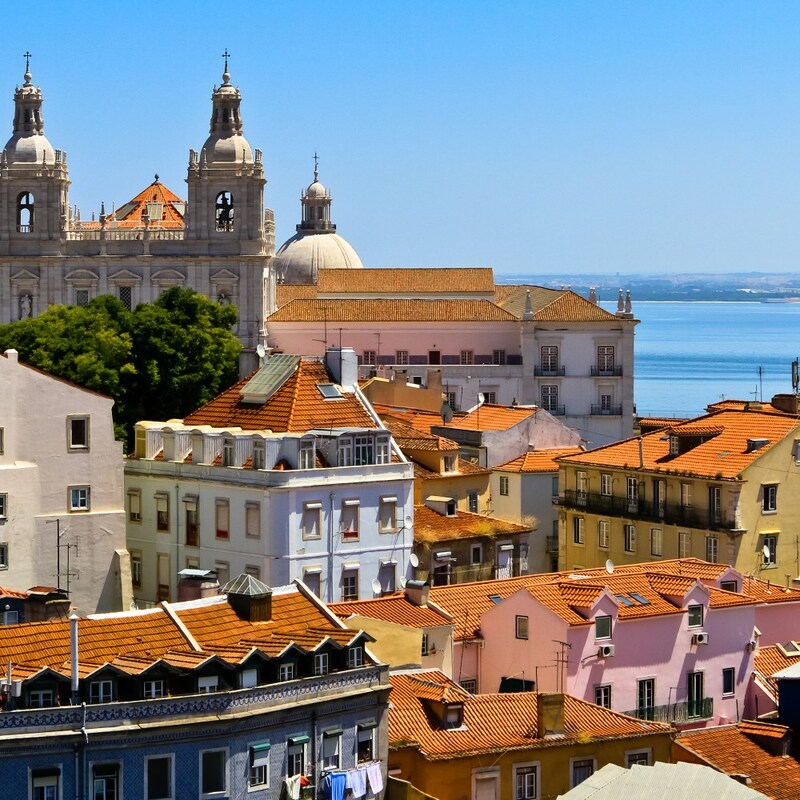 Lisbon’s charm is its mix of ancient, modern, bustling and peaceful, so this afternoon is free to explore. You might be tempted by the chic shops of the elegant Baixa quarter, rebuilt after the devastating earthquake of 1755, or decide to seek out a café to enjoy a bica – a strong espresso often taken with a nata, the city’s devilishly moreish custard tart. Art-lovers can savour the Gulbenkian Foundation, established by an Armenian oil magnate who bought art from Saint Petersburg’s Hermitage after the Russian Revolution for bargain prices. This world-class institution has exhibits ranging from ancient Egyptian treasures to Impressionist paintings to a superb collection of Lalique jewellery and glass. And don’t forget to take a ride on one of the clanging, rattling yellow trams; seemingly well past their sell-by date, they’re still the best way to negotiate the sharp bends of the historic quarter. River Cruise: Prices are per person, based on two people sharing a twin cabin with a limited number of single cabins available on all decks, at the relevant supplement. The price includes full board from dinner on your day of arrival until breakfast on your final day (except for one lunch on the Seine Cruise); if you choose to travel with us on any of the full day excursions by coach, a packed lunch will be provided. Anyone choosing to stay on the ship may of course have lunch in the restaurant; morning/afternoon tea and coffee; all visits and excursions as mentioned in the brochure, airport/station transfers, coach travel as mentioned, travel to and from port of embarkation and the services of a Riviera Travel Cruise Director and Concierge. Extension: The price of this extension is per person based on two people sharing a twin room. 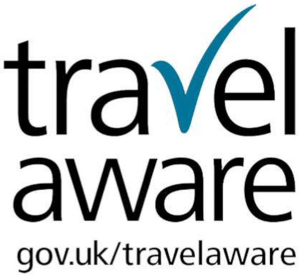 Single rooms are subject to availability and are available at the relevant supplement. 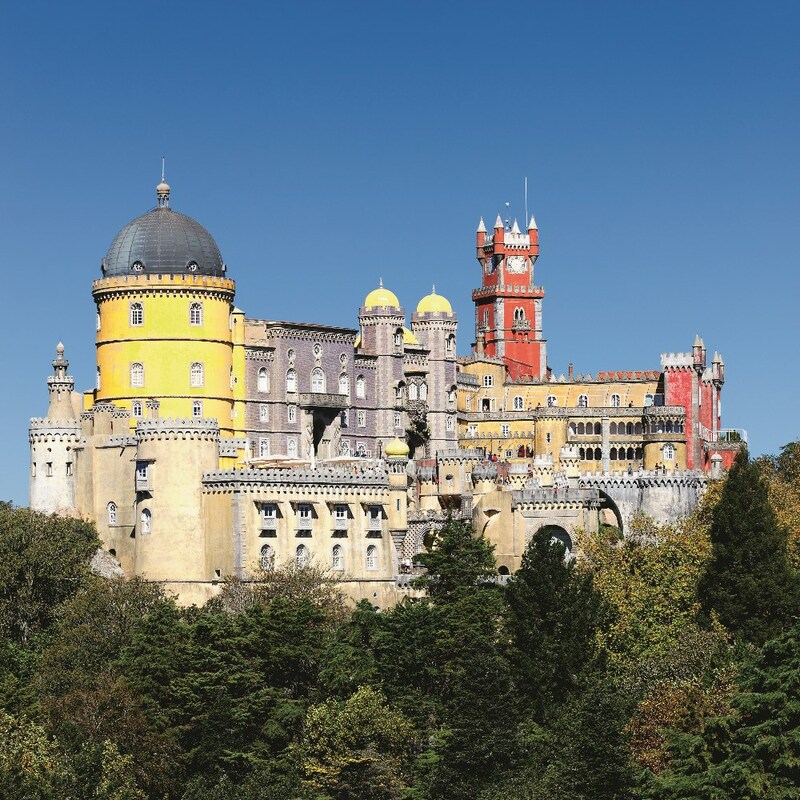 The price includes three nights accommodation in Lisbon with breakfast, all tours as mentioned, transfer to the airport and the services of a Riviera Travel Cruise Director and Concierge. While we include everything you might need in our prices, we never charge for something you might not. If you prefer to pre-order your drinks, you can purchase our drinks package which offers a selection of drinks during lunch and dinner.